Those betting against Tesla make $510 million in mark-to-market profits Friday, according to estimates from financial technology and analytics firm S3 Partners. Tesla stock plunges Friday after a bizarre video surfaces that shows CEO Elon Musk smoking pot on a podcast, and a pair of C-level executives resign. Musk, who has taunted short sellers, appears on Joe Rogan’s podcast smoking marijuana and sipping whiskey Thursday, fueling concerns about the CEO's reported drug use. Short sellers betting against Tesla made more than half a billion off the stock's slide on Friday. After a bizarre video showing CEO Elon Musk smoking pot on a podcast surfaced and a pair of C-level executives resigned, those betting against the company raked in $510 million in mark-to-market profits as Tesla fell more than 5 percent price, according to estimates from Ihor Dusaniwsky, S3's head of predictive analytics. Despite recent gains amid Musk's antics, Tesla short sellers were still in the red for the year until Friday. Bets they've made against the carmaker as a group, which have drawn the ire of Musk, are now profitable for 2018. The firm found that since Aug. 7, when Musk tweeted "funding secured," shorts have made back $3.7 billion in profits on Tesla's 22.5 percent slide. S3 Partners recently developed a website devoted to following Tesla and Wall Street's long and short positions on the stock at shortingtesla.com. Musk appeared on comedian Joe Rogan's podcast smoking marijuana and sipping whiskey Thursday evening. The nearly three-hour interview did nothing to ease concerns about his reported recreational drug use. The following morning, Tesla announced that its chief accounting officer, Dave Morton, had resigned. Morton, who had only been at the company for one month, cited the public attention as a reason for the departure. The company's HR boss Gaby Toledano reportedly won't return from a leave of absence she took last month, according to Bloomberg. Short seller Andrew Left of Citron Research said this week he is suing the company and its CEO for violating federal securities laws after Musk tweeted in August about taking Tesla private. Musk claimed at the time that funding for that effort had been "secured" — which was bad news for short sellers. Those betting against the company lost about $1.3 billion after the tweet, S3 Partners estimated. Shares closed more than 11 percent higher following Musk's announcement that he would take the company private at $420 per share. Musk later reversed course in a blog post, saying the company would remain public because of resistance from shareholders to his plan. Tesla's CEO has taunted short sellers in the past, including Greenlight Capital president David Einhorn. Einhorn's hedge fund said in a letter he was "happy that his Model S lease ended" and was replacing the car because of problems with the technology. 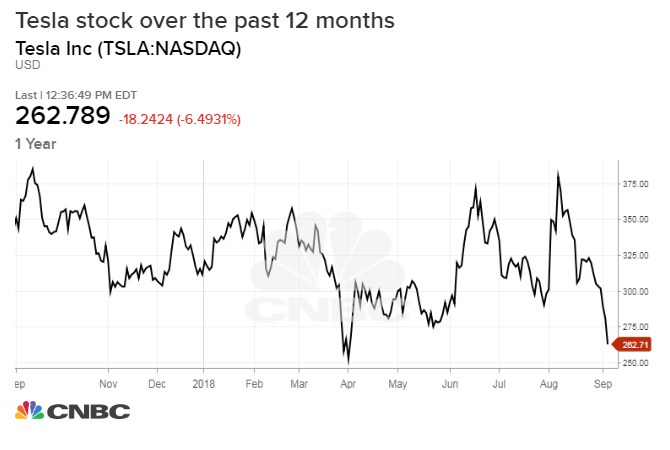 The two also swapped barbs in August after the Greenlight chief reported that the firm's bet against Tesla "was our second-biggest loser" in the most recent quarter. The Tesla CEO has also rumbled with renowned short seller Jim Chanos, who as recently as July accused Musk of over-promising on the electric car maker's capabilities. "What bothers me is not so much the personal stuff and the personal attacks. I'm used to that. It's the willingness to say things that I think he knows are a stretch, to be polite," said Chanos at the time. The founder of Kynikos Associates has been betting against Tesla for years and has also expressed doubts over another Musk venture, The Boring Co. Representatives from Greenlight Capital and Kynikos Associates did not immediately respond to CNBC's request for comment. Shares of Tesla plunged as much as 9.5 percent Friday to $252.25 per share, less than $10 per share above its 52-week low of $244.59 it notched in early April. Shares closed at $263 on Friday, down 6 percent from the open. It was the stock's worst day since June 22. Shares are down about 12 percent this week. The stock is down about 25 percent in the past 12 months and 15 percent in 2018.